One of the most popular smartphone applications on any platform has been the Angry Birds franchise. Now, it’s maker, Rovio has teamed up for something that will have kids in Finland screaming with joy. Rovio and Finnish hotel and resort company Holiday Club will be building Angry Birds Activity Parks in three of its spa hotels. The parks will be year-round indoor playgrounds with the first scheduled to be completed by Christmas 2012 in Kuusamon Tropiikki. 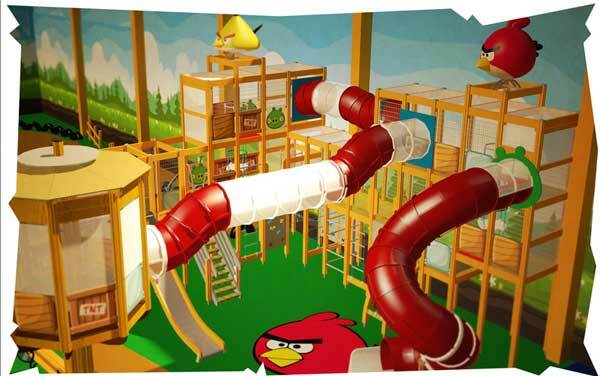 In February 2013, another Angry Birds Park will launch in Saariselkä with another one coming in the fall to Saimaa. The image above is a rendering of what the activity park will look like. I wonder why we’re not seeing Angry Birds playgrounds or theme parks launch in the United States yet. I know my kids would go bonkers to play at one of these.